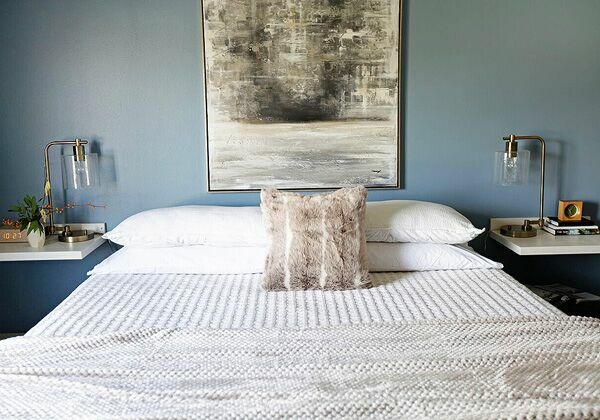 Some of the biggest changes we made were painting the walls white, updated bedding from West Elm and new bedside table lamps from Target . 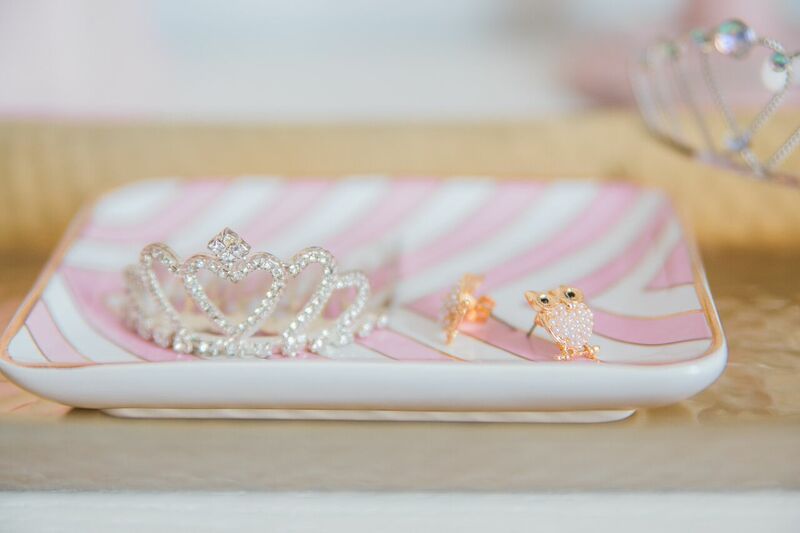 Subtle touches of pink help to break up all of the white. This bench was one of my favorite finds from Overstock – I love the mix of leather, wood and metal. This metal chair with leather pad from Home Decorators was another great addition to add extra seating and more places to set stuff on. 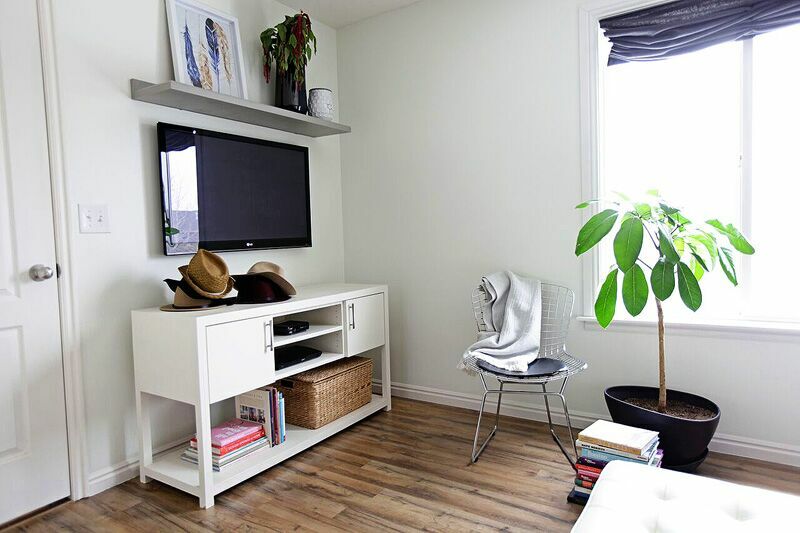 This custom TV stand made by BreinholtDesign fits perfectly on the wall. I added more storage underneath with this basket from Pottery Barn . I love baskets with lids to hide the clutter. I love switching things around on my dresser to keep things new and fresh. 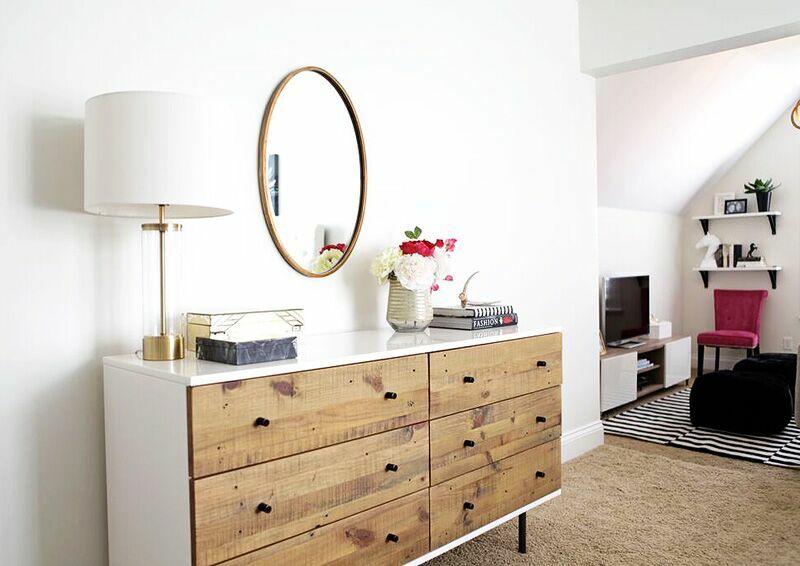 This gold mirror from West Elm was the perfect accent to bring in more hints of gold. And finally these polished brass frames from West Elm helped me to personalize the space with one of my favorite quotes and a picture of me and my hubby. 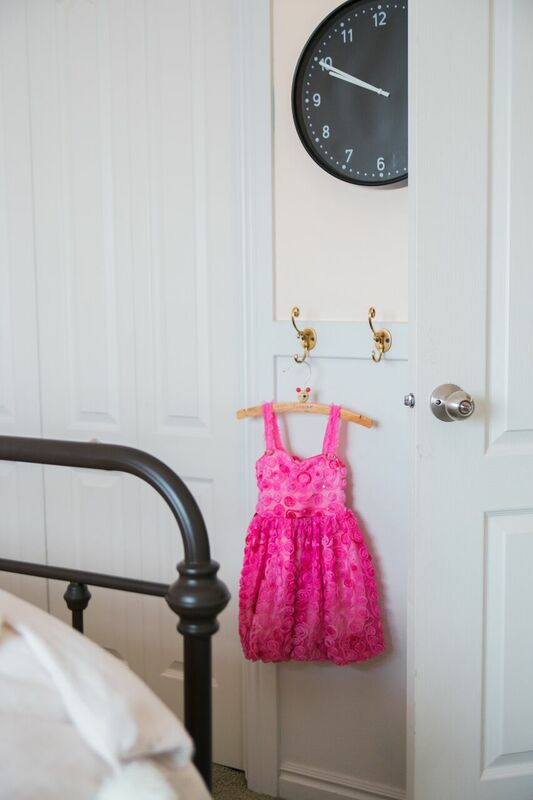 I knew it was time to update my girls room when my toddler kept getting out of her toddler bed to sleep with her big sister- or into our bedroom to complain about something! I remember sharing a bed with my sister when I was young so I figured we’d try a bigger bed for the both of them. It worked!!! Since the day we got the bigger bed it’s been such a huge improvement- she stays in bed, her and her sister get to bond and she even gets excited for bedtime- hallelujah!!! 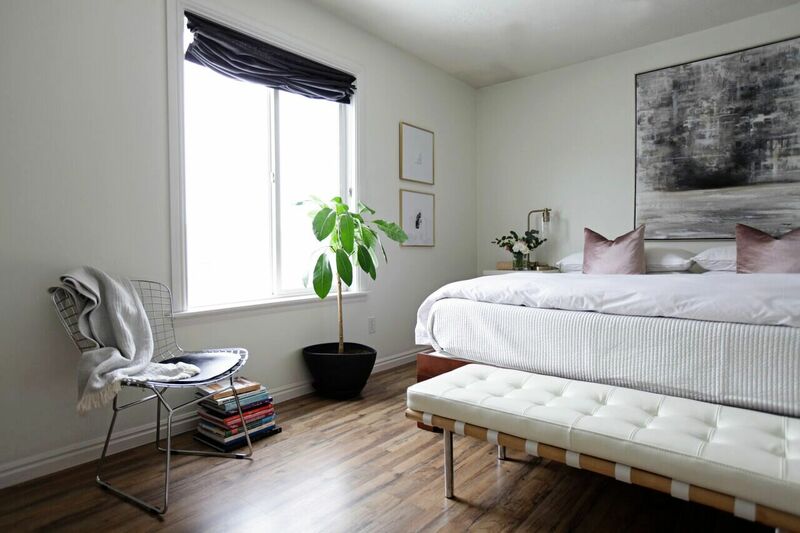 Choosing the bed frame was key and this one from Overstock didn’t disappoint! It said that it was a dark brown metal on their website (which it is) but really looked black to me which was what I was wanting. I let my 8 year old daughter help with the bedspread decision but we both fell in love with this colorful balloon one from The Land of Nod . This Plum & Bo pom pom duvet is from Urban Outfitters and was a no brainer- I’m obsessed with pom poms and it screamed ‘little girls room’ to me! 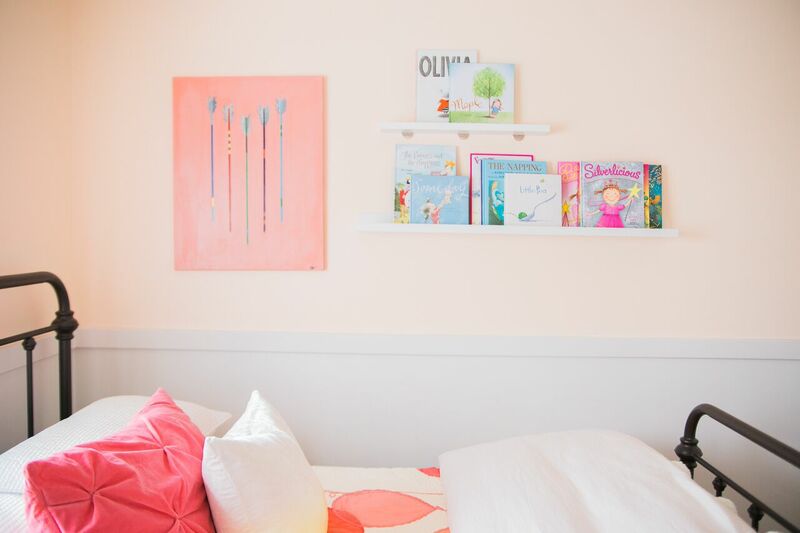 My girls love to read their books, and with books as cute as these I figured I’d make them a decorative feature in their room. These thin shelves from Ikea are actually picture ledges but work great for books. I love that they are visible and easy to access so the girls think to read them often. The art is a custom piece by Breinholt Design- it couldn’t work better in the space. With limited space in the room I had to choose a dresser that was skinny and wide. This one from West Elm was the perfect fit. 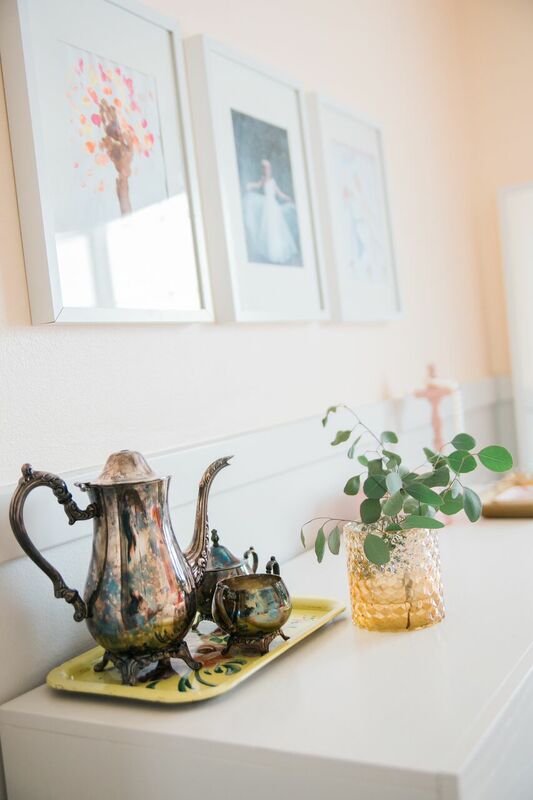 I used small details like this vintage tea set and their own artwork to personalize the space. These touches were added by the girls themselves!!! I love having hooks in kid spaces to corral clothing items and stray toys. 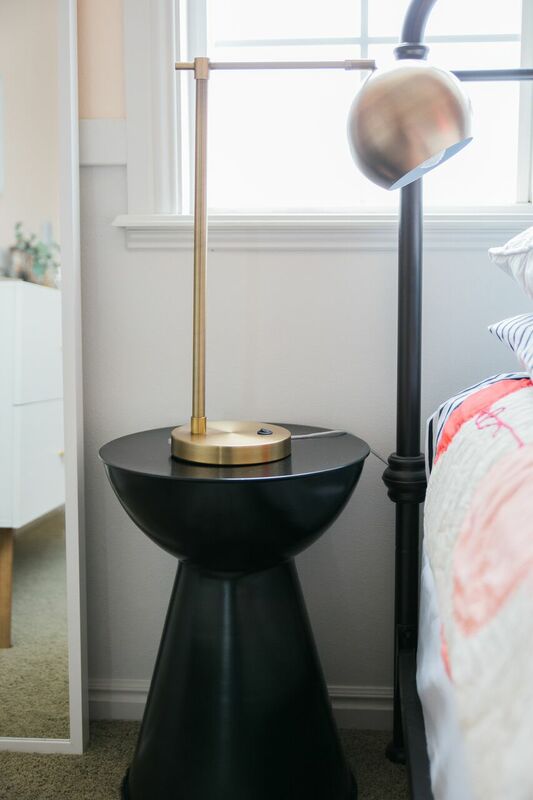 And I think gold accents, like this lamp from Target work perfectly with the peaches, pinks and reds and black accents. 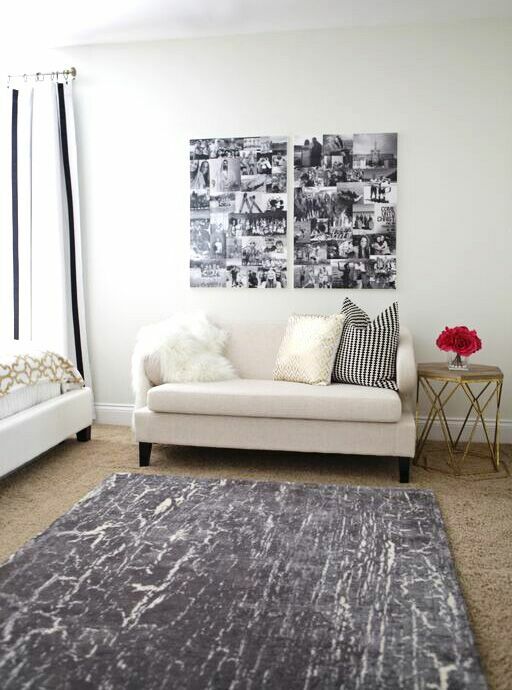 Finally, this black and white rug is by Nate Berkus from Target that I purchased last year. 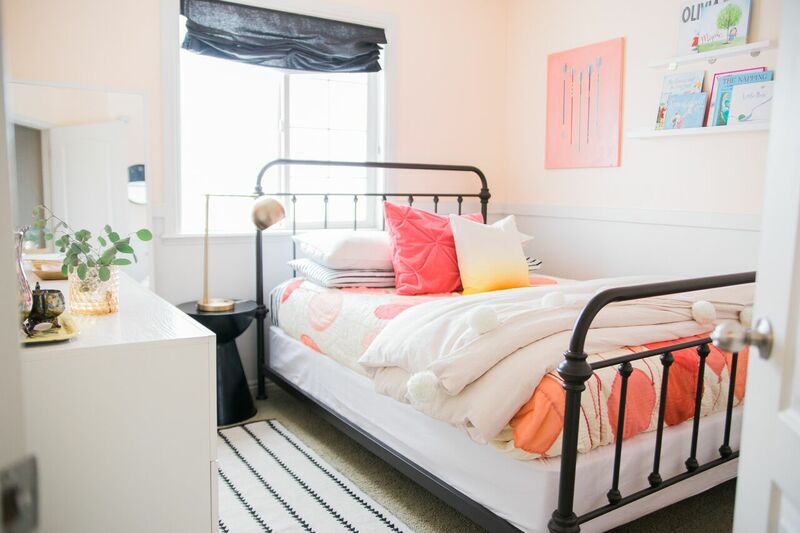 I thought carrying the black and white accents to the floor was the perfect addition to complete their room! 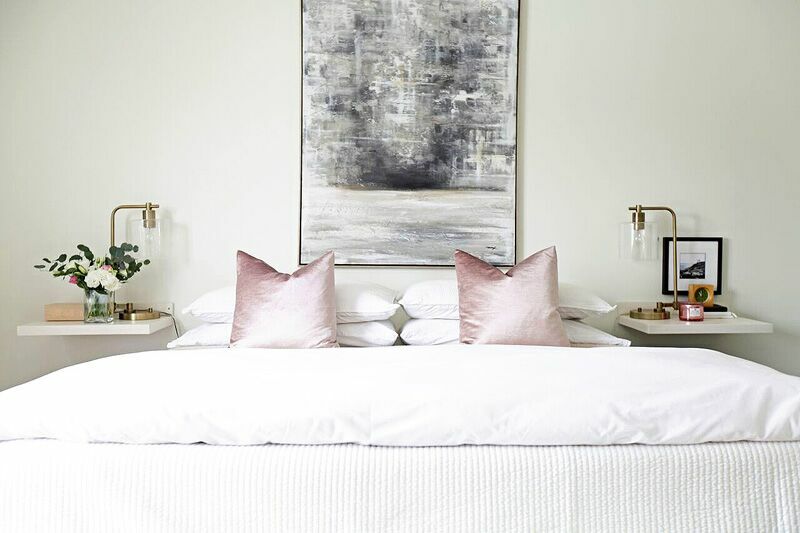 There are tons of ways to display pillows in a bedroom but I’ve narrowed it down to my top 4 most commonly used displays. 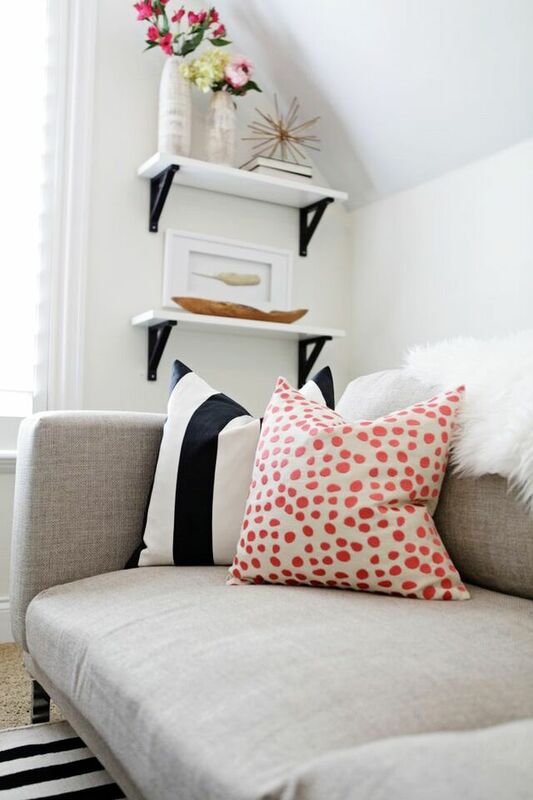 This look is simple- stacked shams with one accent pillow. Fewer pillows make for less pillows to remove from the bed when getting into it. Simple yet impactful. I change the pillow out with each season so that it coordinates well with the weather outside. This look uses only shams- no throw pillows. 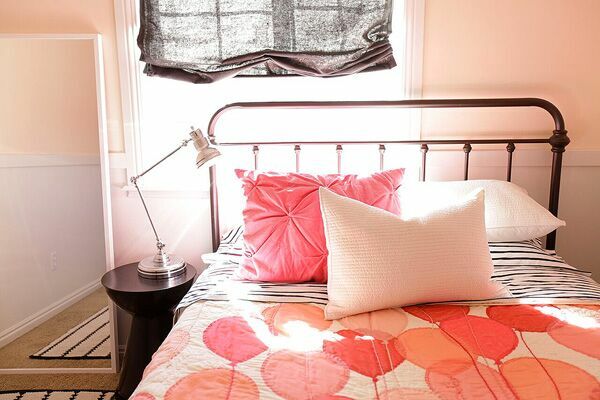 Another simple look that is clean and colorful by adding the pop of color with one of the shams. This is probably the most common use of bed pillows- Euro size pillows in the background with throw pillows in the foreground. 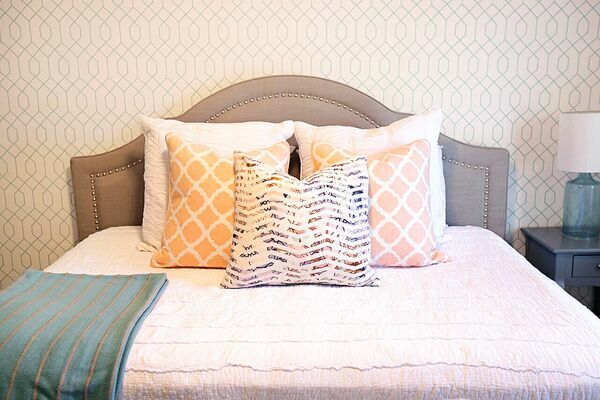 I love the symmetry and use of varied sizes and patterns to give the bed some interest. 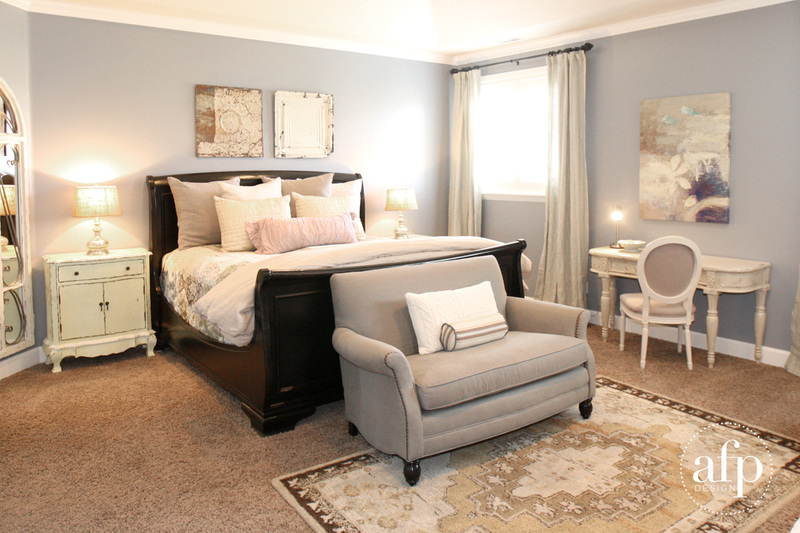 This look combines all of the styles- Euro layered in the background with standard shams and a throw pillow in front. Great for a more formal bedroom to add texture and make the bed look full and inviting. 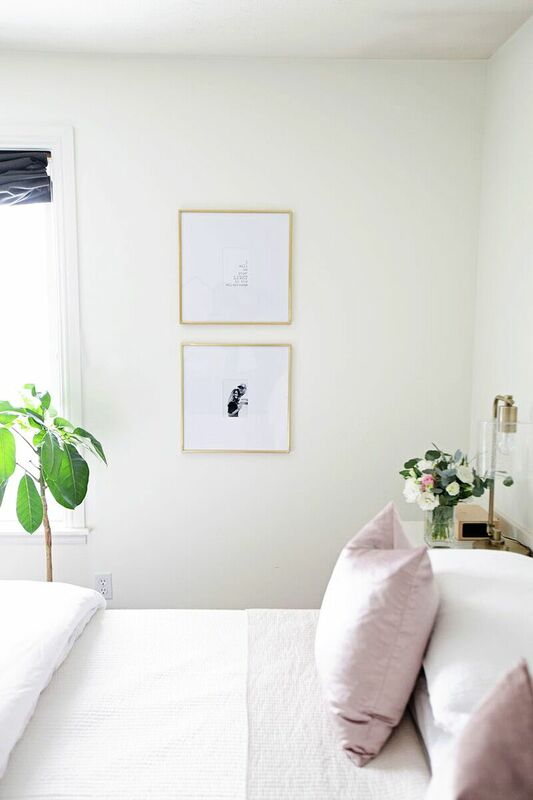 White on white with gold and black accents was the goal in this bedroom make-over. 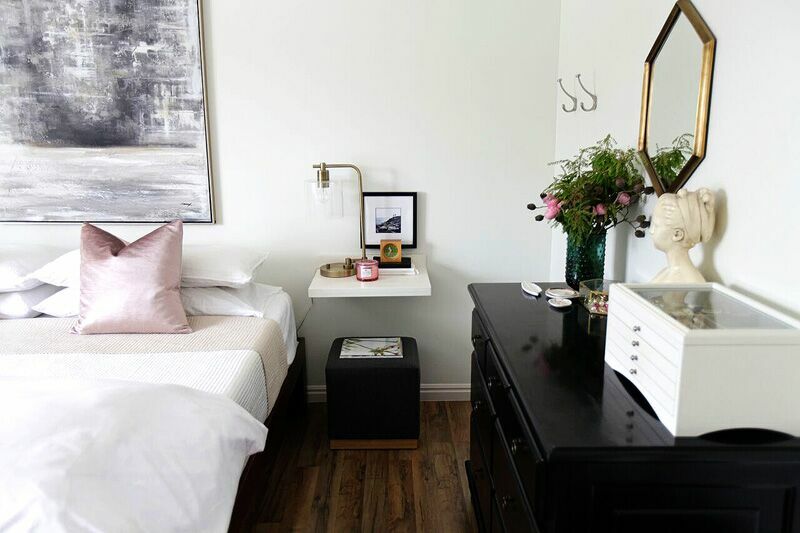 White bed (bedding from West Elm), white walls and white curtains with a hint of black (from Pottery Barn Teen ) were the perfect starting point. This blanket from ZGallerie was just the right addition to add some color, pattern and a touch of gold. This black and white photograph collage was my client’s idea and just the right way to personalize her daughter’s space (couch from Target and rug from West Elm ). 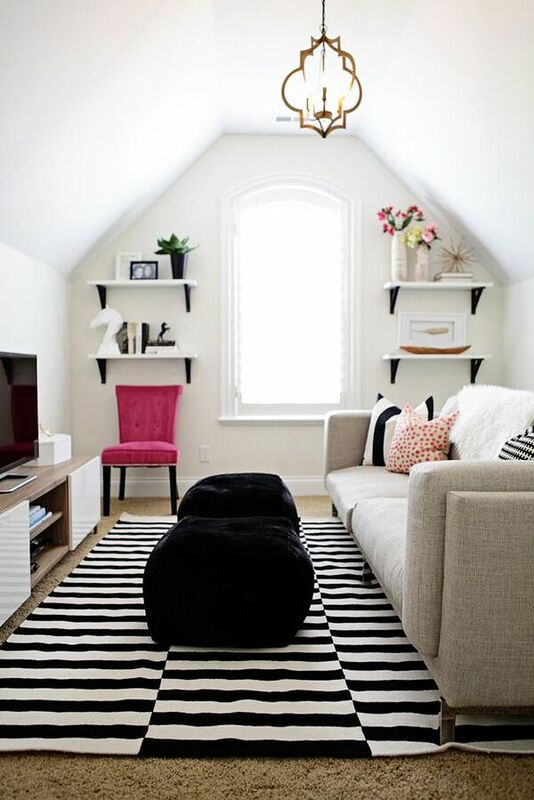 I love adding rustic elements to warm up a space and break up the starkness of black and white. 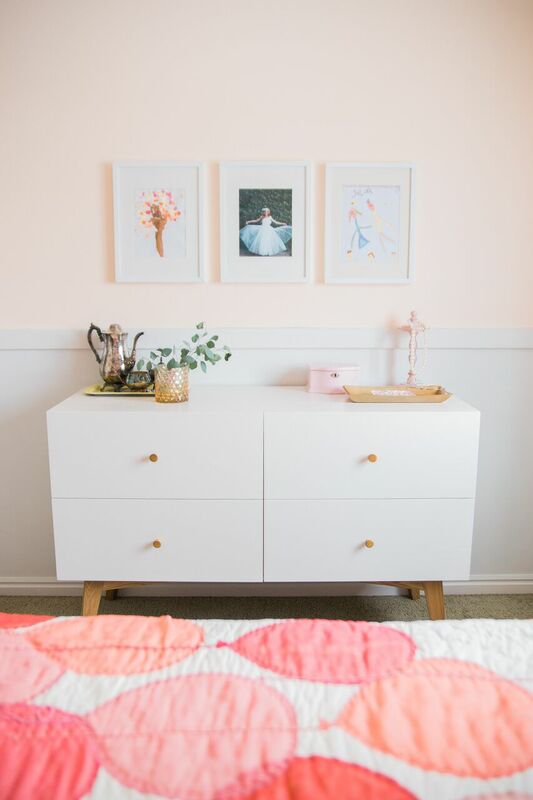 This dresser from West Elm did just that! Continuing the color palette of blacks, whites and golds we carried it into the adjoining TV room. 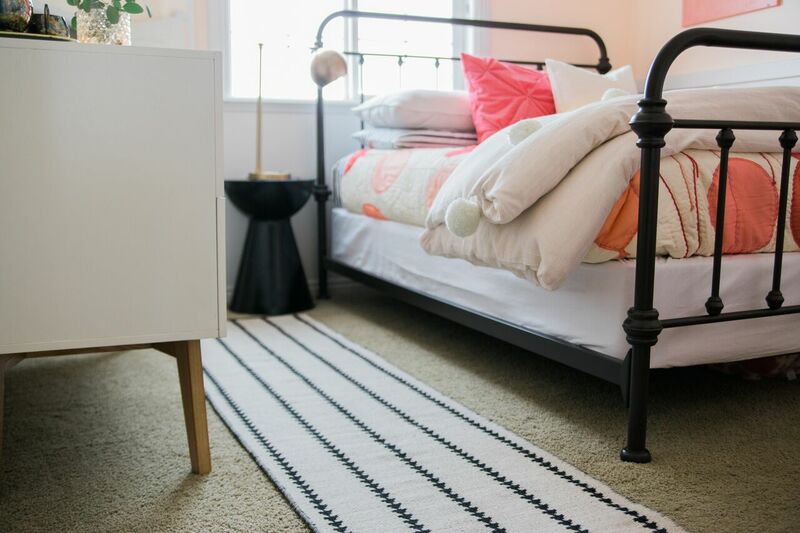 This bold rug from Ikea brings the space together perfectly. We flanked the window with shelves which are a great way to make room for displaying personal items and photos. It’s amazing how a new light can change a space so dramatically! This one from Shades of Light was like the cherry on top of this room. 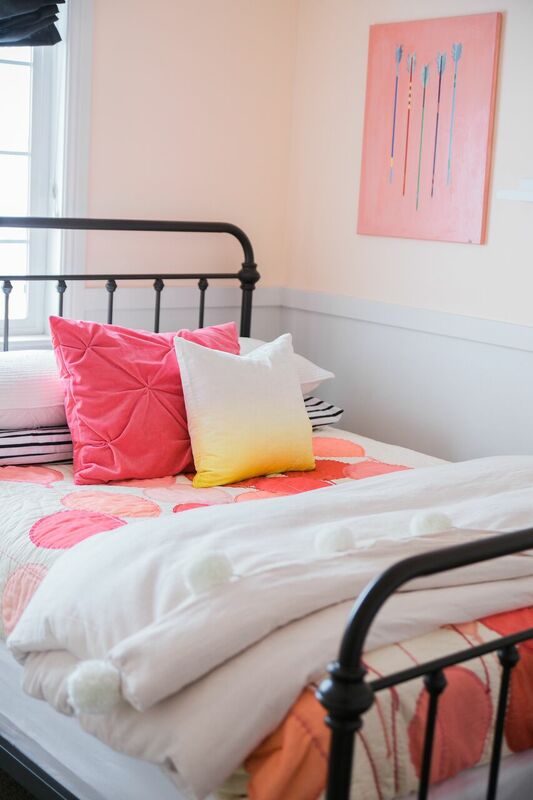 Touches of pink and fur give this room the feminine touch it needed to feel young and girly for this almost graduated teen. So happy with the end result of this space and lucky to have clients with such sophisticated palettes!